Beef and lamb slowly cook in Middle Eastern spices for a hearty, flavorful meal. Preheat oven to 325 degrees convection, or 350 on conventional setting. In an oven safe cooking vessel (see notes), heat the olive oil on the stove top on medium heat. Add the onion and cook for about 5 minutes, until it begins to soften. Add the carrot and cook for a few more minutes. Add the beef, and brown the beef, turning occasionally. After the beef has browned on all sides, after about 10 minutes, add 1 cup of water along with the garlic and spices: cinnamon, cumin, saffron, oregano and paprika. Bring the water to a simmer, then cover move the beef mixture to the oven. Cook for 30 minutes, then add the lamb along with the 2nd cup of water. Cover and return to the oven. Cook for another 90 minutes after adding the lamb. Remove from oven, add the eggplant and the apricots. Cover and return to oven, cook for another 30 minutes. The tagine cooks a total of 3 hours in the oven. Remove the tagine from the oven. Place on the stove top, on medium low heat. Stir in the chickpeas, cilantro and lemon. Simmer for about 5 minutes to let the flavors meld together. Serve over the tagine over couscous for a traditional presentation. We served with farro, which is another tasty option. Enjoy! 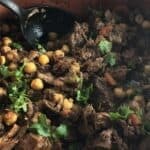 You can make this in a traditional tagine cooking vessel, or use a Dutch oven or a Copper Chef pan for the job (Amazon affiliate link provided). The beef takes longer to get tender so it starts 30 minutes prior to the lamb.